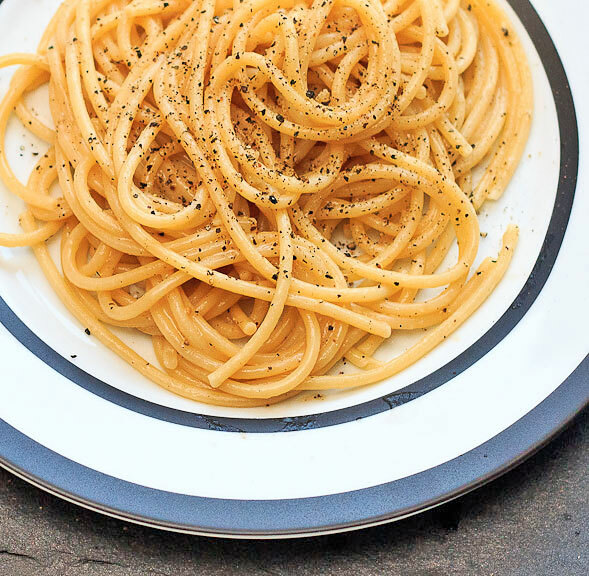 One of my all-time favorite dishes, Cacio e Pepe, is a quick and rustic pasta that’s extremely minimal on the ingredients. 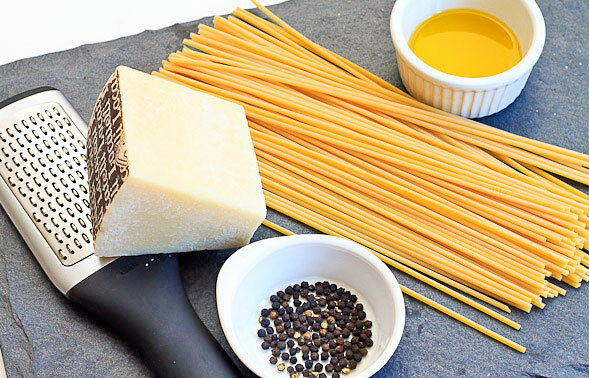 This classic Roman dish literally translates to Cheese and Pepper in Italian, and that’s basically what it is! The first time I had it was a few years ago in Rome and I’ve been hooked ever since. There are many different variations of this recipe. Some chefs toast the pepper first or add butter, and some include small pieces of pork. My version, however, is very simple and straightforward. 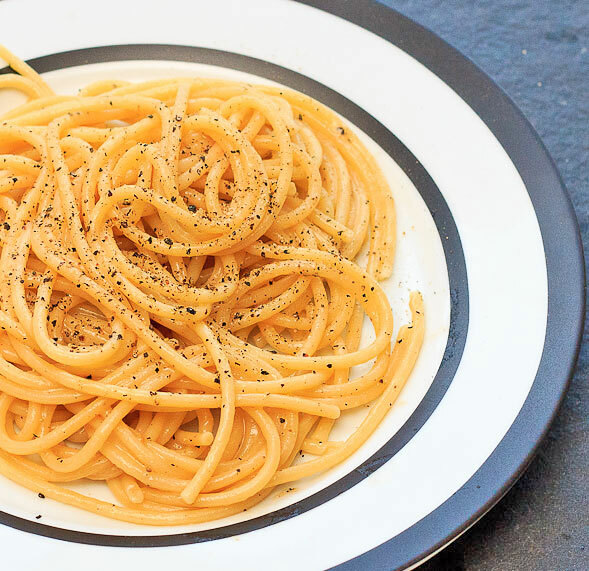 The great thing about Cacio e Pepe is that it doesn’t take much longer than 15 minutes and uses readily available ingredients. 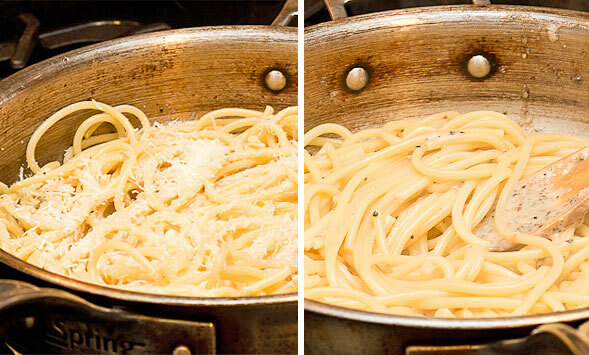 I normally cook with whole wheat pasta, but with Cacio e Pepe I typically “indulge” and use regular white pasta. And be sure to use freshly cracked black pepper instead of already ground. For this recipe, you want to taste the heat of the pepper. 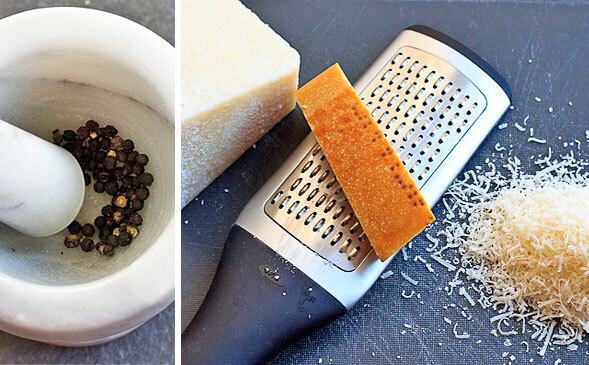 Grind up peppercorns and grate the cheeses. Heat olive oil in a pan and add crushed black pepper. Stir in some pasta water. Toss in cooked pasta and stir to coat with oil and pepper. Add cheese to make the sauce, stirring vigorously so the cheese doesn't clump together. Add more pasta water if needed. Serve with more cracked pepper and grated cheese. Bring a pot of about 3-4 quarts of heavily salted water to a boil. Add pasta and cook until slightly less than al dente, about 8-9 minutes (taste pasta after about 8 minutes to make sure you don’t overcook it). Reserve 1 cup of pasta water and drain pasta. In the meantime, heat olive oil in a skillet over medium heat until the oil shimmers. Add black pepper and cook until fragrant, 1–2 minutes. 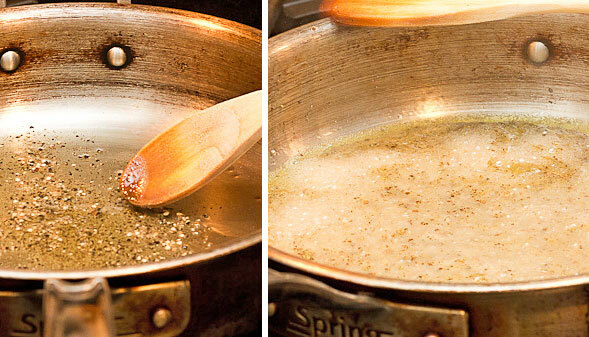 Add in about 3⁄4 cup of the pasta water into the skillet and bring to a boil. 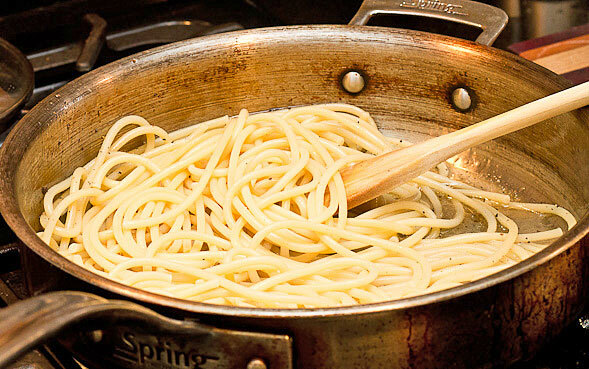 Transfer pasta to skillet and spread noodles evenly. Sprinkle the cheese over top and toss quickly to combine until the sauce is creamy and clings to the pasta without clumping, about 2 minutes. Add more pasta water if mixture seems dry. Transfer to serving plates and sprinkle with remaining cheese and more fresh black pepper.